UNITED KINGDOM’S 1st and the Oldest Hindu Temple , Leicester’s Shree Hindu Temple will be attempting to create a new world record by making a world record breaking 501 Kilo grams of Churma (Modka) Ladoo (Indian Sweet Delicacy) during United Kingdom’s first ever Ganesh Puran (Hindu Religious Scriptures texts eulogising the glory and significance of Lord Sri Ganesh) event at the temple premises over eight days. The Churma (modak) Ladoo, we believe, will be the Heaviest, Biggest and the Tallest. Lord Sri Ganesh, son of Lord Shiva ( the third deity of the Hindu triad of great Gods and the destroyer and personifies both the destructive and procreative forces of the universe of elimination of trouble) and Parvati, the fertility goddess. In fact Lord Ganesh has at least 1000 names. He is also called Sri Ganapati (leader of people), Buddhividhata ( god of knowledge ), or Vighnahara (god to remove obstacles). He is called Ganapathibecause he is the supreme Lord of the Ganas (Ganas are the embodiments of the organs ofperception – Jnanendriyas – and of action – Karmendriyas). “Ga” means Buddhi (intellect). “Nail means”Vijnana” (wisdom). “Pathi” means master. Hence, another meaning for Ganapathi is master of theintellect and wisdom. Lord Sri Ganesh is considered as the Lord of learning and patron of letter. He is one themost important Gods in the Hindu religion so that all sacrifices and religious ceremonies, all seriouscompositions in writing, and all worldly affairs of importance are begun with an invocation to Lord SriGanesh. The elephant faced God is worshipped as the very first deity before beginning any ceremony, ritual or vow. Worshipping Lord Sri Ganapathi endows man with the courage and confidence neededto enter upon and carry through any undertakings in the world. Therefore in Hinduism every rite,ceremony and project is always started with the worship of this God – Lord Sri Ganesh.Lord Sri Ganesh is usually depicted as an elephant head figure with a large pot belly. He has fourhands with one hand always extended to bless people. Like most other Hindu gods, he has a ‘vehicle’, in his case a rat: this rat is usually shown at the foot of the god, but sometimes Lord Sri Ganesh isastride the rat. This unique combination of his elephant-like head and a quick moving rat vehiclerepresents tremendous wisdom, intelligence, and presence of mind. Lord Sri Ganesh – the elephant – deity riding on mouse – has become one of the commonestmnemonics for anything associated with Hinduism and also Indian culture. This notonly suggests the importance of Lord Sri Ganesh, but also shows how popular and pervasive thisdeity is in the minds of the masses. The son of Lord Shiva and the goddess Mata Parvati Lord SriGanesh has an elephantine countenance with a curved trunk and big ears, and a huge potbelliedbody of a human being. Lord Ganesh’s head symbolises the Atman or the divine soul, whichthe ultimate supreme reality of human existence, and his human body Signifies the earthly existence of human beings. The elephant head denotes wisdom and his trunk represent Om, the sound symbolof cosmic reality. In Lord Sri Ganesh’s upper hand he holds a goad, which helps him propel mankindforward on the eternal path and remove obstacles from the way. the noose in Lord Sri Ganesh’s lefthand is a gentle implement to capture all difficulties. the broken tusk that Lord Sri Ganesh holds, likea pen in his lower right hand is a symbol of sacrifice, which he broke for writing the Manabharata.The rosary in Lord Sri Ganesh’s other hand suggest that the pursuit of knowledge should becontinuous. The ladoo (indian sweet) Lord Sri Ganesh holds in his trunk indicates that one mustdiscover the sweetness of the Atman. His fan-like eras convey that he is all ears to our petition. Thesnake that runs around Lord Sri Ganesh’s waist represents energy In all fonns. And Lord Sri Ganesh ishumble enough to ride the lowest of creatures, a mouse. Lord Sri Ganesh is the Lord of success anddestroyer of evils and obstacles. He is also worshipped as the god of education, knowledge,wealth wisdom and happiness.In fact, Lord Sri Ganesh is one of the five prime Hindu deities (Brahma Vishnu, Shiva andDurga being the other four) whose idolatry is glorifJeCI as panchayatan puja. To celebrate UnitedKingdom’s First Hindu Temple’s 42nd Anniyersary the Board of Trustees and devotees of Leicester’s Shree Hindu Temple & Community Centre is organising United Kingdom’s first ever Ganesh Puran (Hindu Religious Scriptures texts eulogising the glory and significance of Lord Sri Ganesh) at the Temple at 34 St. Barnabas Road, Leicester, LES 4BD from Sunday 19th June to Sunday 26th June 2011.The Puran consisting of one hundred and thirty six pages, two sections – upasanakhanda or sectionon devotion and the kridakhanda or section on the divine play has two hundred and fifty sevenchapters. The Ganesh Puran will be recited by Hindu Temple’s renowned young priest Shastri Shree Dilipbhai Joshi daily between 10:30 am to 12:30 pm and 3:30 pm to 6:30pm. Shashtri has studied at the world famous Shree Sola Bhagavat Vidyapitha in Ahmedabad India and he has recited the Bhagwat Katha, Shiv Puran and Ganesh Puran (all scriptures) on many occasions. Lord Ganesh’s favourite food is CHURMA (modak) ladoos (Indian sweet). Consequently the highlight of the programme will be an attempt to create a new world record by making what we believe to be the world record breaking at least five hundred and one kilo grams of Chunna (modak) ladoo (Indian sweet) at the temple premises by the Temple’s own chef Mrs Bhanuben Durgai and Mrs Shital Trivedi. This will take approximately four days to make. The two chefs will bejoined by twenty volunteers from the temple’s devotees and several very special guests from all walks of life and religion, including local dignitaries, business community and local schools and many phototaking, video recording and interview opportunities will be available to everyone, including press and media. It is hoped that representatives from the Guinness book of world records will be present to witness the beginning process of this world record breaking attempt from 3 pm on Monday 13th June2011 and to witness its completion on Friday 17th June. 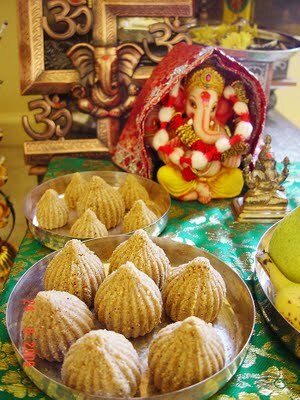 As in contemporary Hindu religious practices, the.desire to get prasad and have darshan (blessings)are the two major motivations of pilgrimage and temple visits the edible CHURMA (Modak) ladoo, after first offered to Lord Sri Ganesh, and the ladoo having the deity’s blessing, will be distributed as Prasad (offering) to all devotees and followers on the first day of Ganesh Puran (Hindu ReligiousScriptures texts) on Sunday 19th June 2011 by the priests. Registered Charity, Leicester’s Shree Hindu temple was established in 1969. It is the first HinduTemple to be opened in the United Kingdom. Since its opening the temple has achieved many firsts. The Ganesh Puran and the making of what we believe to be the Heaviest, Biggest, Highest and Churma (modak) ladoo to be made. Thank you Sister Zara for your Email- Most of our devotees are vegetarians. The temple would find it most useful if you could direct us to the diabetic recipies that would help indian vegetarian diets. hello, I tried some of the Ladoo and it was incredibly mouth-watering and I would like to give some appreciation to the chefs: Shital Trivedi and Bhanu Durgai for making this Ladoo. Is it possible to get this excellent recipe from either of the chefs?